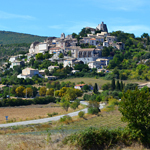 I’m not sure if having one of the world’s best known artists cut off an ear in your town is a recommendation or not but it is one of the little quirks that make historic Arles in Provence one of those destinations where you say ‘REALLY?’ a lot. It’s also old. So old that it’s difficult to grasp that some of the buildings you cast your eyes over date from as far back as 46 BC. One moment you can be standing on a street where the great Julius Caesar nobly strode then, turn a corner and you’re faced with a café from one of Van Gogh’s most famous creations. The historic centre of Arles is relatively compact, subsequently it’s easy to get round nearly all the highlights on foot in a day. 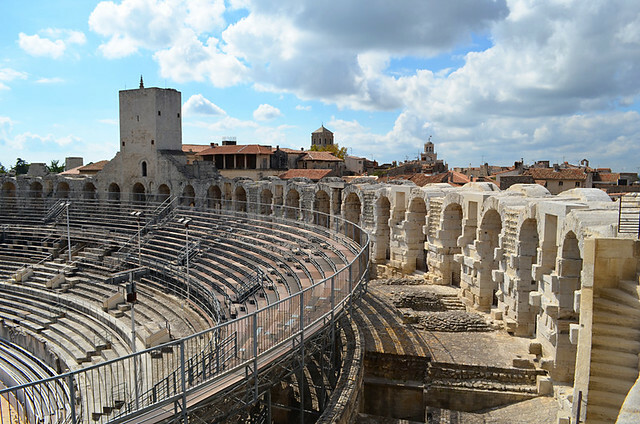 These are our pick of the things to see and do in amazing ancient Arles. Immediately you’re hit with a giddy mix of architectural styles that span the centuries. 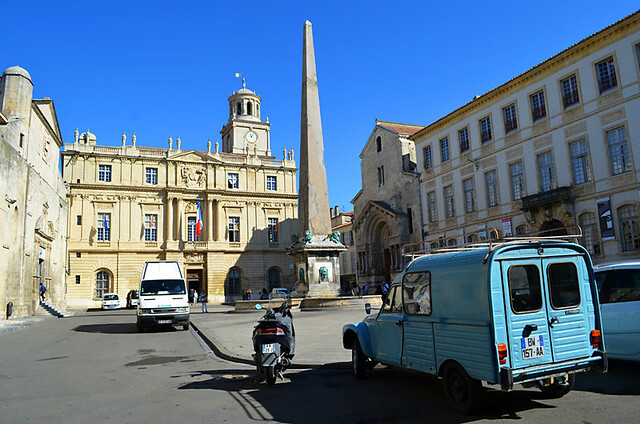 The simple Roman Obelisk in the centre of the square dates from the 4th century when charioteers used to race around it. However, it was a bit Humpty Dumpty when it was discovered in two pieces in 1389 and it was another 300 years before the Roman Obelisk stood proud again. The bronze lions at the base are newcomers, added in the 19th century. Standing at the top of the Place de la Republique is the Hotel de Ville which was built during the town’s glory years and completed in 1676; although some parts are older (the bell tower) and some parts are younger. Lining the square are more golden oldies, Saint Trophime (a cathedral until the Revolution) and the Chapel of Sainte-Ann, now an exhibition hall. These were part of the Roman Forum and date back to 46 BC. 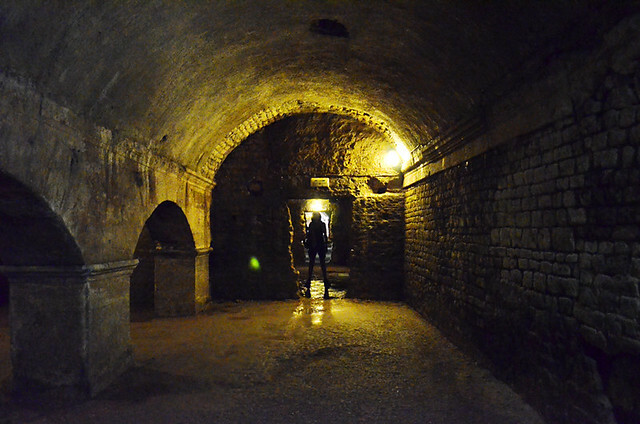 Roman constructions are ten a penny in this part of Provence, but what makes the Cryptoportiques different is that they’re underground, way beneath the Town Hall. You access them via the Town Hall’s foyer (pause to take a look at the unusual barrel vault ceiling). To say they’re atmospheric is an understatement. As well as being historical curios they are likely to awaken the Indiana Jones/Lara Croft in you. A pretty Provence square that used to be the site of the Roman Forum (see above, as it’s now below if you get what I mean). But the real ‘WOW’ factor for us was to see the actual café made famous by a Van Gogh (not original) that hung on our living room wall for years (corny, but we liked it and it matched the colour scheme) – Le Café de nuit. I have to admit though, I couldn’t quite match up the painting with the reality. Maybe if I’d seen it at night it might have been different. The old hospital, originally built in 1573, has a sombre façade with tiny windows – a feature of hospitals at the time; intended to keep diseases within these walls. 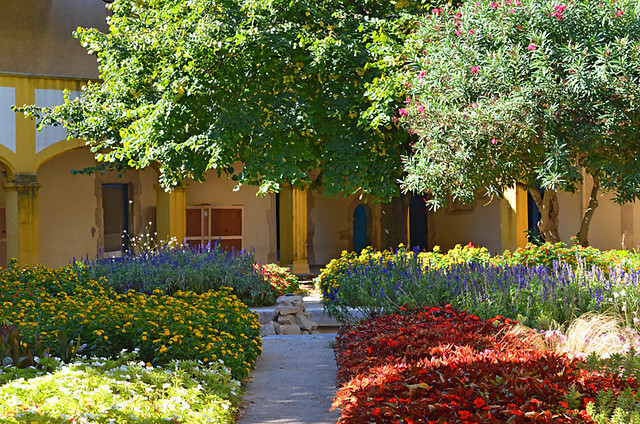 Inside is an open courtyard garden with a radiant display of flowers that should have artists reaching for their easels. The draw of this place is that it’s where Vincent Van Gogh came after he chopped off his ear. Another ancient edifice from 4BC. In truth they’re more curious than visually impressive. I used to believe that the oft exposed flesh in the tv series Rome a few years ago was to bump up viewing figure. But the Romans weren’t a prudish lot and it wasn’t uncommon for men and women enjoy the hot baths together free of any clothing. Opposite the baths is the Rhone. It’s not the greatest view of the river but it’s pleasant enough for a short, riverside stroll. By the time you reach Place Voltaire, it’s time for a rest. 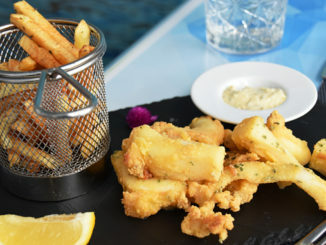 Place Voltaire is a relaxing place for lunch with restaurants around the square offering good value lunch deals (formule) which include a combination of entrée and main course, or main course and dessert. 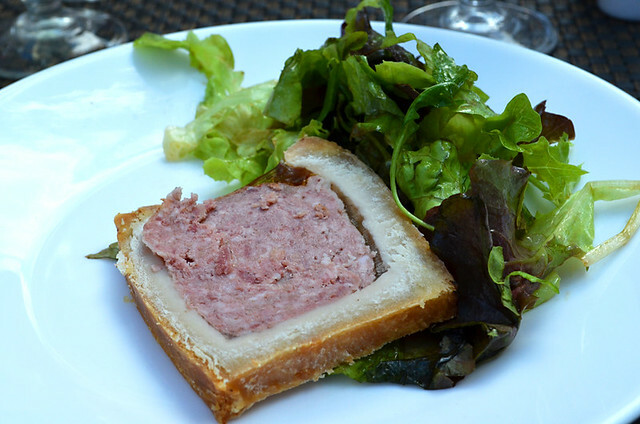 We opted for the appropriately named Le Voltaire where a meal consisting of a starter of pate en croute (which was just like a big slice of pork pie) and a main course of a chunky salmon fillet in a light, lemony sauce with rice and fried courgettes plus wine cost €25 for two. The food was good, the service nice and friendly and it was people-watching heaven. Next to us, a group of Japanese diners surveyed their ‘unusual’ food with wide-eyed curiosity, even smelling the salt pot. It made me realise how we must look when we travel to far flung places and do the same with what must be everyday foods to the locals. 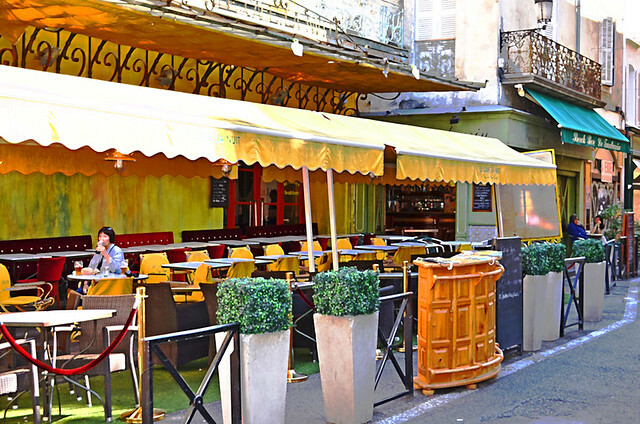 There are oodles of appealing restaurants around this area with Restaurant Cador along Rue Voltaire winning the prize for the most delightful looking restaurant in town, it’s almost a cliché of Provence charm. 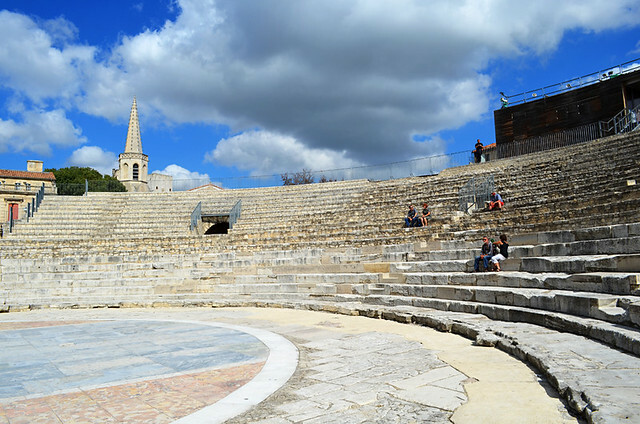 The Roman Amphitheatre is unmissable – in a couple of ways. It’s an Arles highlight and it dominates this part of the town. 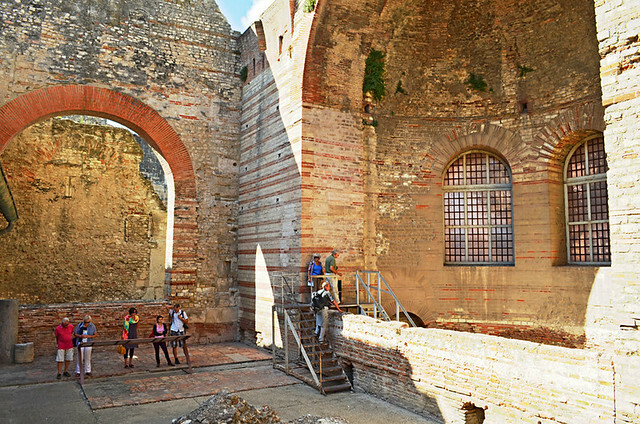 Beautifully preserved, walk through those Roman arches into the sunlight and a bout of the “My name is Maximus Decimus Meridius, commander of the Armies of the North… Father to a murdered son, husband to a murdered wife…” is almost guaranteed. What’s particularly good about Arles’ Amphitheatre is it is still used as a venue for entertainment. These days it’s bullfights (Provence style which means no bull killing) rather than gladiators slugging it out. Close to the Amphitheatre is the Theatre Antique. After the Amphitheatre, the Theatre Antique struggles to impress and can be viewed from the outside without having to pay an entrance fee. It is a pretty cool venue for summer concerts though. Next to the Theatre Antique is the Jardin D’Été. 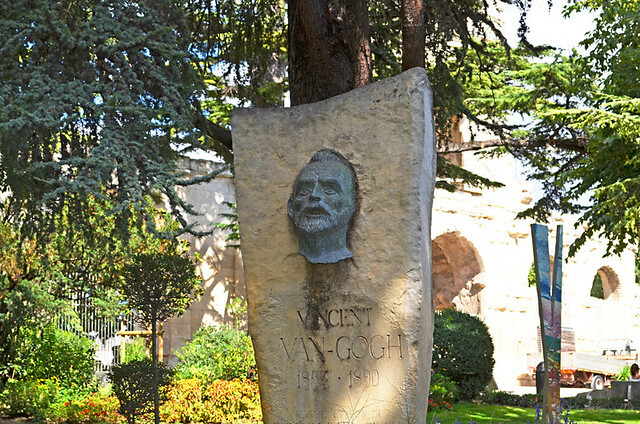 As well as being a bit of an open air sculpture gallery, the gardens are home to a statue of the man himself, Vincent Van Gogh… minus an ear. 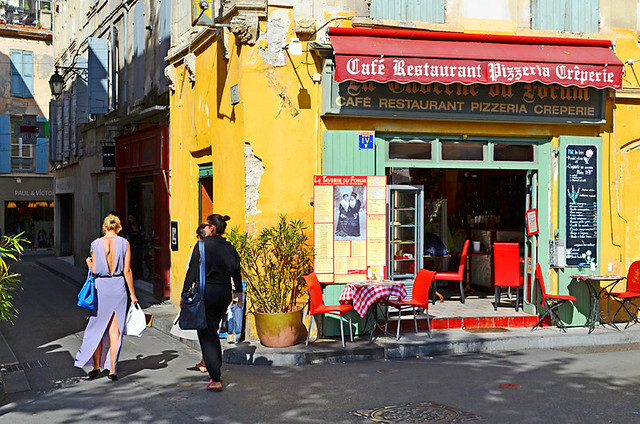 Even though Arles is filled to overflowing with historic buildings much of its charm lies in simply exploring its warren of streets. There are interesting things to see everywhere and enticing bars and restaurants galore. It’s got a huge personality that should win over lovers of art and style as well as those fascinated by the past. We came, we saw, we revelled in art and history and we left with ears intact. That’s a great day out in our book. The way to see as much of Arles without spending too much money is to pick up a ‘passport’ from the tourist office on Esplanade Charles de Gaulle. 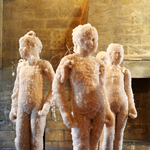 There are various combinations so you can customise to choose what interests most – art, museums, historic buildings or a mix. 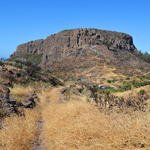 Most sights are open from 9am till 6 or 7pm, with some closing between midday and 2pm.